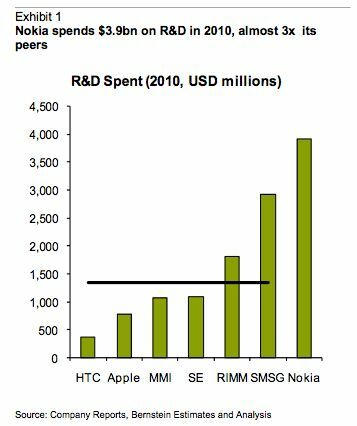 Bernstein Research chart above is to wonder what value Nokia's massive R&D spending has achieved. Sadly, that's our second and third reaction, too, having spent some time with the company's Symbian OS. Let's just hope all that money was poured into MeeGo or some other megaprofitable ecosystem that it will "build or join" in 2011. US$7.24 billion spent on R&D) after the break. Visualized: Nokia R&D spending, almost 3 times its peers originally appeared on Engadget on Thu, 03 Feb 2011 07:45:00 EDT. Please see our terms for use of feeds.